Copyright © 2006, 2009, 2010 by David Jungblut. All rights reserved. No part of this publication may be reproduced or distributed in any form or by any means, or stored in the database or retrieval system, without prior written permission of David Jungblut, Ocean City, New Jersey. 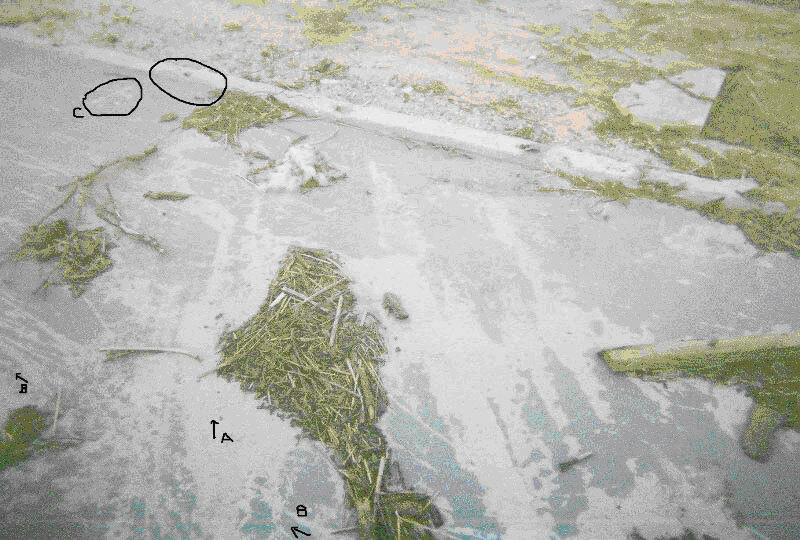 Why Did the New Orleans Levees Fail? 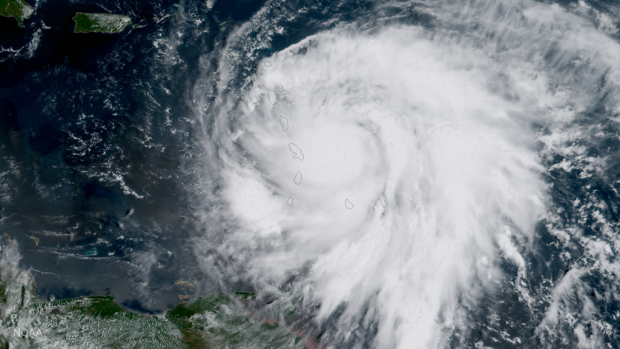 The thesis advanced in this article will show recently-uncovered evidence indicating that downburst energy, in the form of microbursts, generated straight-line winds and could have been part of the mechanisms resulting in the failure of the New Orleans levees during Hurricane Katrina. 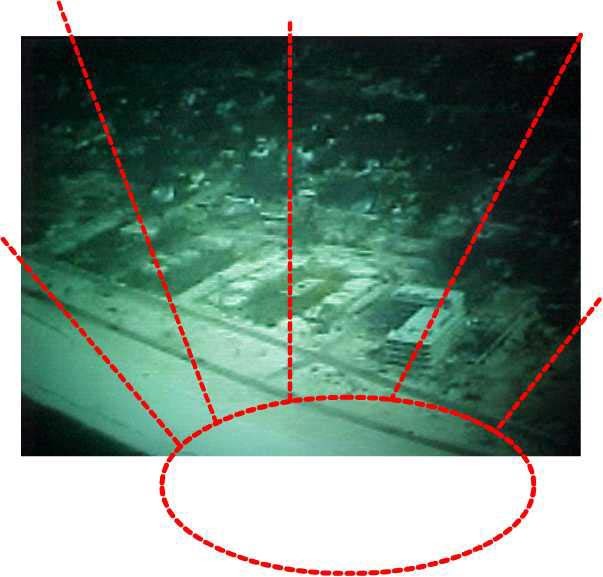 Why did the New Orleans-area levees fail? 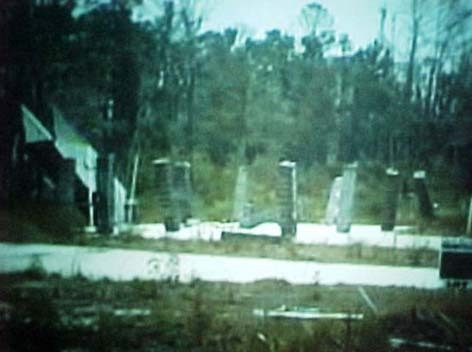 This is one question left unanswered, even after an extensive review by the federal government was published in “Technical Note 1476: Performance of Physical Structures in Hurricane Katrina and Hurricane Rita: A Reconnaissance Report”, by the National Institute of Standards and Technology (NIST). 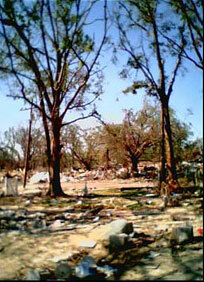 The NIST report stated: “The mechanisms should be fully investigated using rigorous models and experimental analysis before firm conclusions can be drawn.” I suggest that the models will be inconclusive unless microburst and straight-line energy are taken into account in the models with the equivalent level amount of energy level that my study indicates. 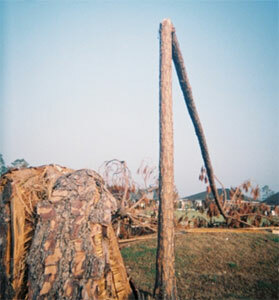 Microburst (a downburst that is smaller than 4 Km in size) and straight-line energy were part of Hurricane Katrina’s assault on Mississippi, and the following evidence will show that microburst and straight-line energy were part of the storm that hit New Orleans and surrounding areas, as well, and a possible factor in the destruction of the levees. 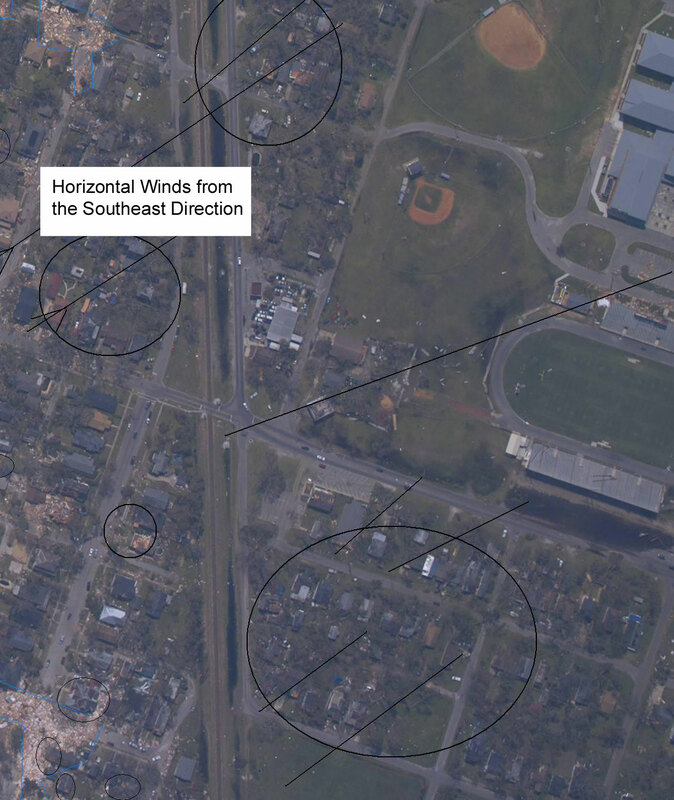 The following map shows the location of a series of photographs that depict storm damage in the New Orleans-area. The 17th Street Outfall Canal carries discharged water from Jefferson Parish and New Orleans Parish to Lake Pontchartrain. 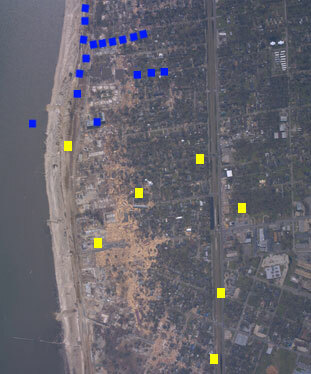 The concrete levee system was beached at N30 00.972 latitude W90 07.239 longitude; this beach caused extensive flooding of New Orleans Parish. 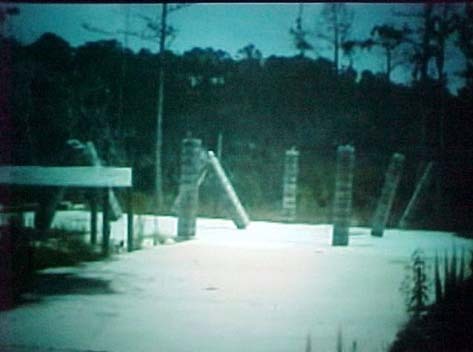 The flood protection wall in this photograph looks to be unaffected and shows no signs of stress due to the hurricane, but the next section is missing. 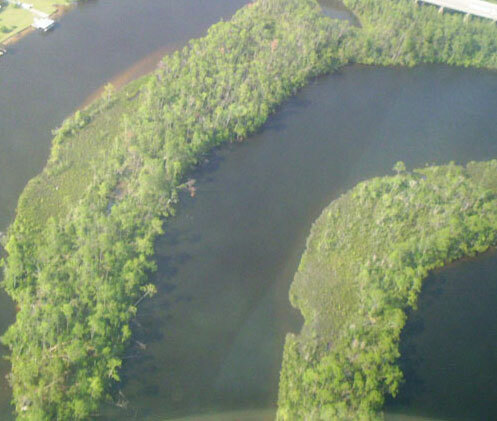 Can water alone place stress on one section of levee and the adjoining section unaffected? 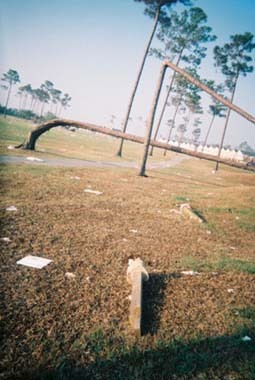 Water alone cannot do that, however, wind can cause just this effect in the form of straight-line winds from microbursts. The jet-like currents of air can impact a discrete area and leave nearby areas unaffected. 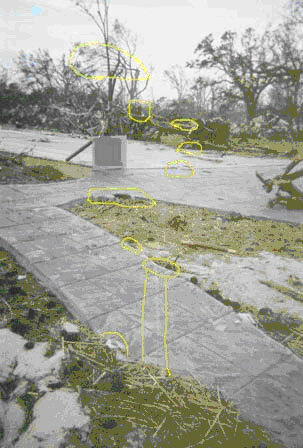 Searching National Oceanic and Atmospheric Administration’s (NOAA) Hurricane Katrina images at noaa.gov, one can locate evidence that microbursts and associated straight-line winds were active during Hurricane Katrina as shown in the next photograph near the breach at Jourdan Road. 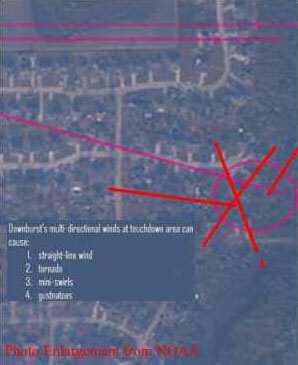 The large red circle painted on the NOAA image, shows a microburst (a downburst that is smaller than 4km). 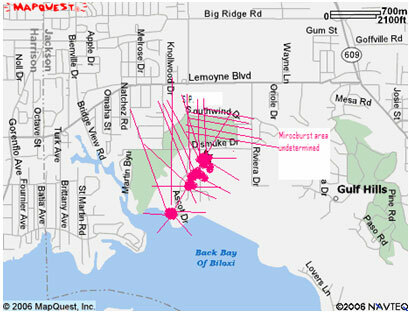 The red lines show the star-burst pattern in which the trees fell; this indicates that multiple wind directions were present during Hurricane Katrina. 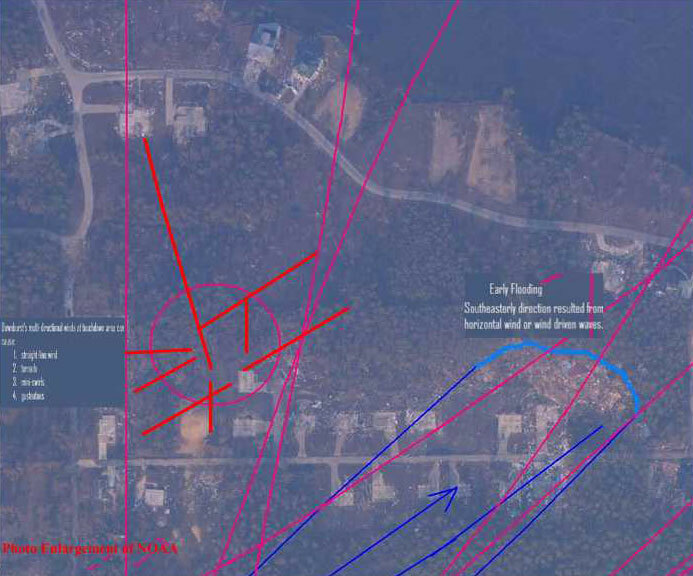 The small circle lines indicated damage to the surrounding buildings, along with possible ground damage to the road embankment on Jourdan Road. 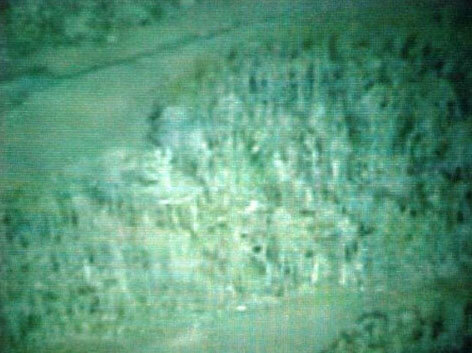 A close up of the area shows the trees falling in multiple directions. 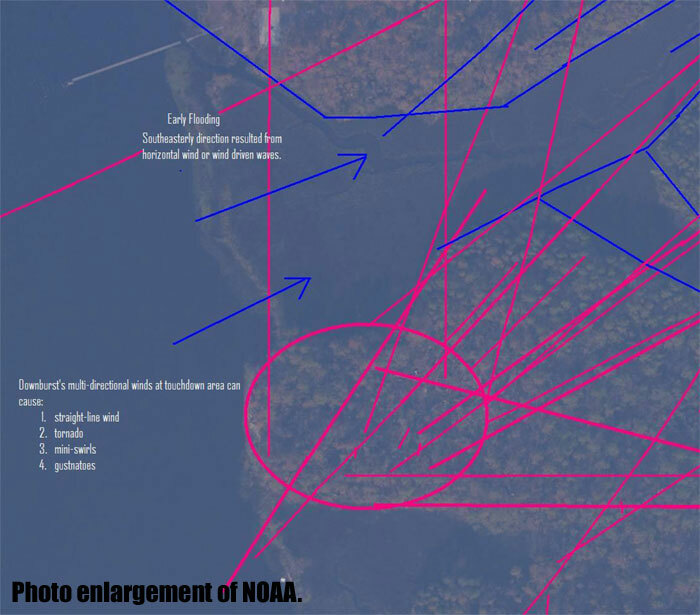 The next photographs (#4 to #6) were taken between the breach that occurred at 17th Street Outfall Canal (See Photograph 1) and Lake Pontchartrain. 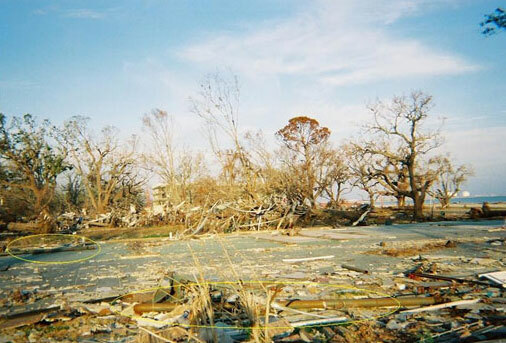 The area took a heavy beating during Hurricane Katrina with debris hitting the walls of the levees and the bridge as shown in Photograph 3. 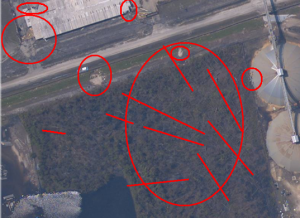 The bridge and levees in this area acted as a dam that blocked the inward flow of debris, but both the bridge and levee walls in this area held up well and were not breached. 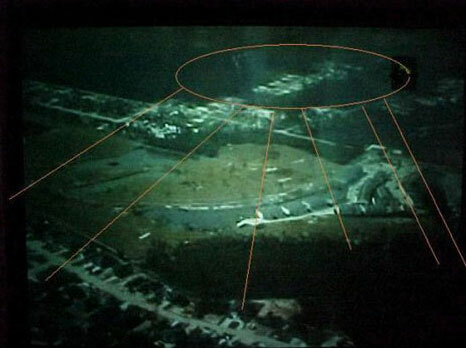 Closer inspection reveals that some buildings in the area did suffer damage from strong winds, as seen the Photograph 5. 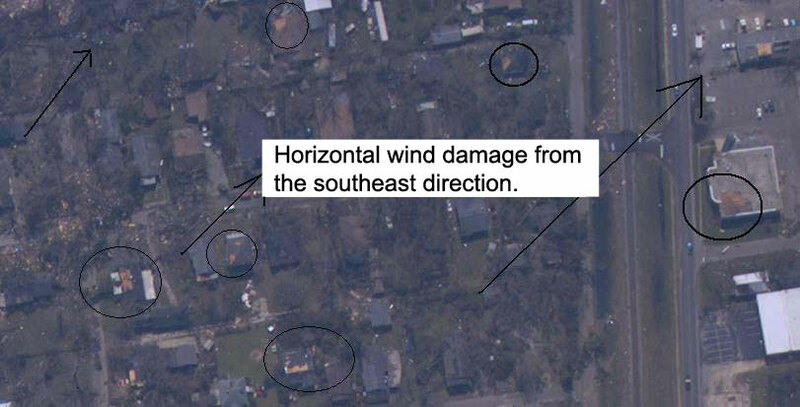 The circled buildings show evidence of strong wind damage: the tin roofs of the buildings in the lower right were peeled back; the roof of the one middle building was also peeled back and the other middle building shows multiple-direction wind damage; and the building in the upper left looks to have taken a direct hit from a small microburst causing three fourths of the building to be “blown” apart with debris scattered on three sides. 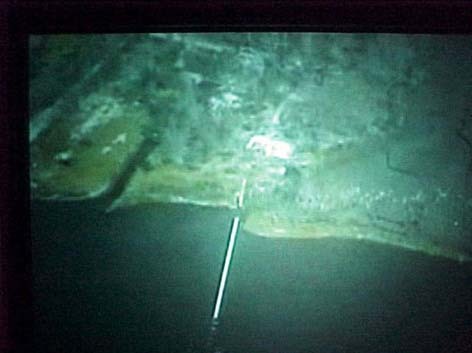 The next photograph shows that the breach at 17th Street Outfall Canal and the surrounding neighborhood experienced wind damage. 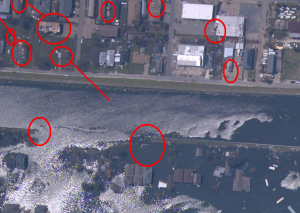 Photograph 6 shows the heavy flooding flowing into New Orleans Parish at the breach. 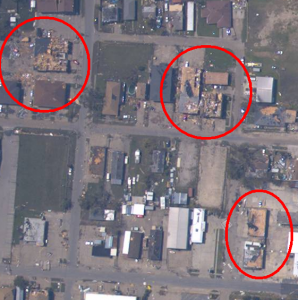 Some of the buildings just north of the breach show roof damage that can be attributed to strong winds. 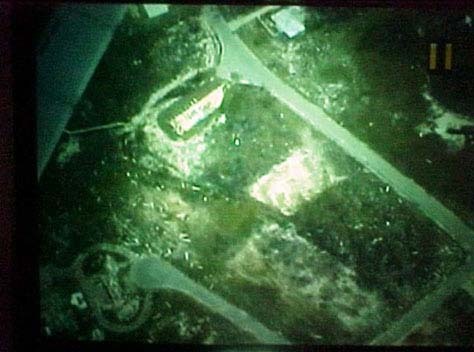 Further south near one of the two breaches at London Avenue, two other buildings were “blown apart” with debris scattered in three directions, as if a small microburst hit them. See Photographs 6 and 7. 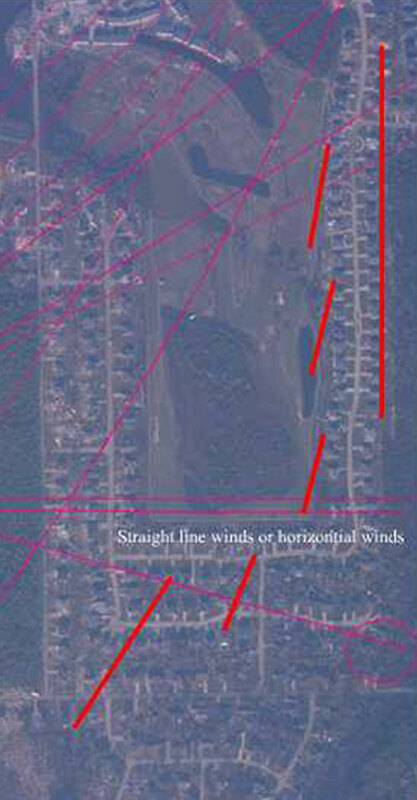 In photograph 7, the large circle shows the breach at London Avenue and the upper right circle shows the house that experienced a microburst. 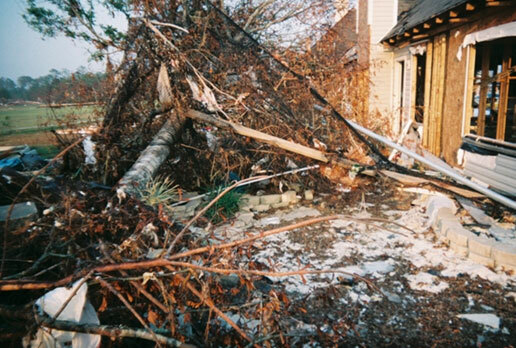 Photograph 8 shows another house that was hit by microburst energy, demonstrating that high winds were active in the area during Hurricane Katrina. 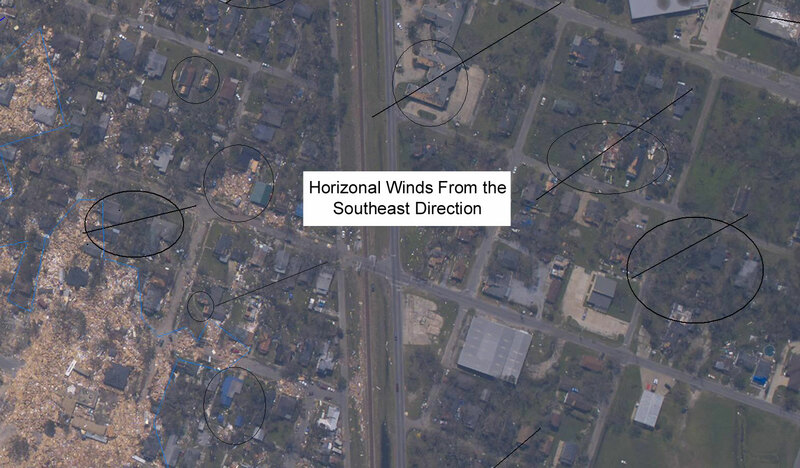 Applying the Fujita Tornado Damage Scale (with the appointed damage as a guide), we can estimate the wind speed at 207 to 260 miles per hour. 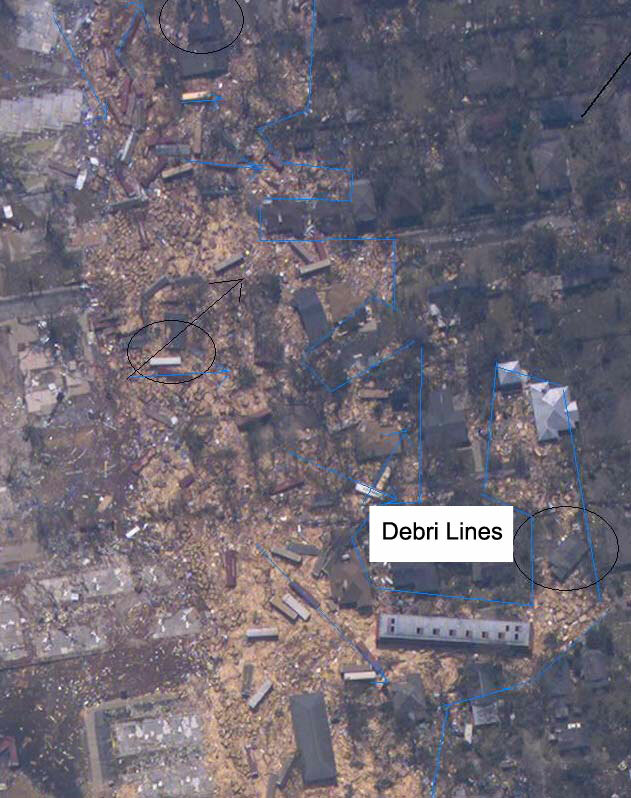 The Fujita Tornado Damage Scale is provided at the end of this document. 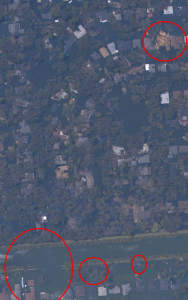 It is legitimate to query: If these houses experienced downburst winds could these same winds have impacted the levee system? 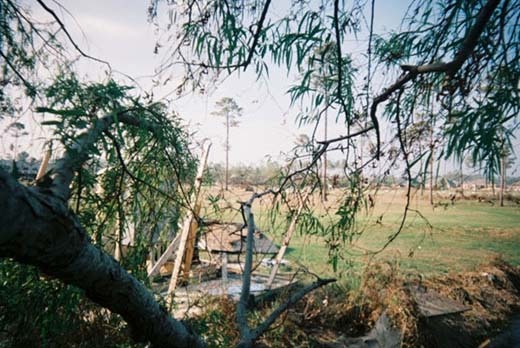 The following warning was indeed issued on the day Hurricane Katrina approached. 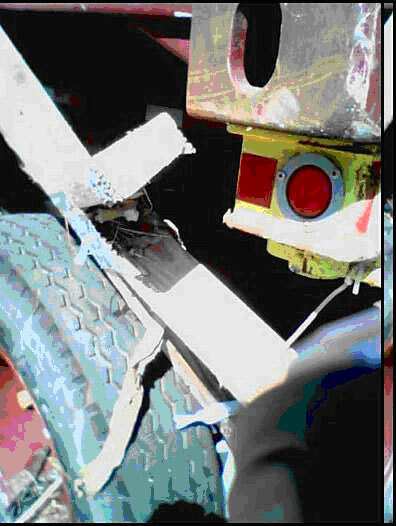 STRUCTURAL FAILURE IN THE NEW ORLEANS METRO AREA. SEEK SUBSTANTIAL COVER NOW!!! THIS IS A LIFE-THREATENING SITUATION. Coinciding with these catastrophic wind warnings, three of the nine levees failed at about 9am. The others followed within the next 24 hours. The words in the warning seem to indicate the winds could have caused “STRUCTURAL FAILURE IN THE NEW ORLEANS METRO AREA” affecting all the levees during the “8:32 AM CDT” reporting window or immediately after. 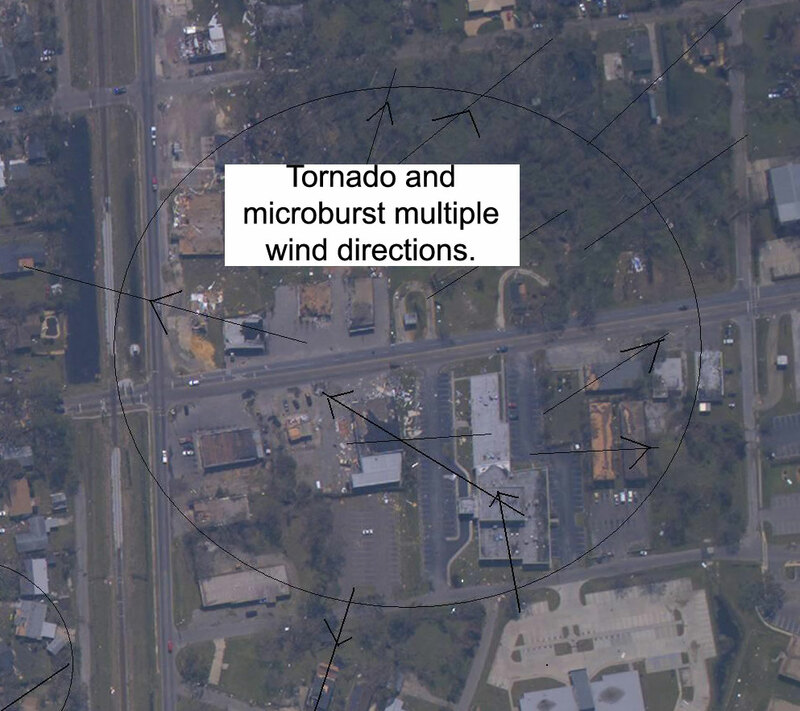 In conclusion, the science of microburst and straight-line winds are a relatively new field of inquiry and not known to exist until Dr. T. Theodore Fujita described microburst and straight-line winds in the 1970’s. 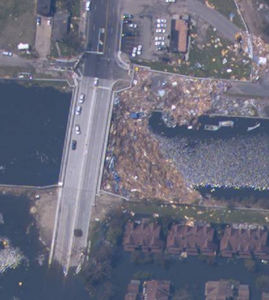 The models that explain why the levees failed will be inconclusive unless microburst and straight-line energy is incorporated at the correct levels of energy within to the models. 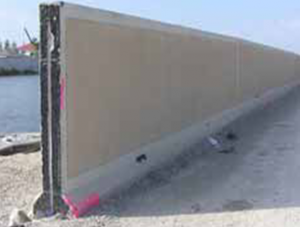 The evidence indicates that microburst and straight-line winds speeds of 207 to 260 could have caused the walls of levees to fail. F0 < 73 Light damage. 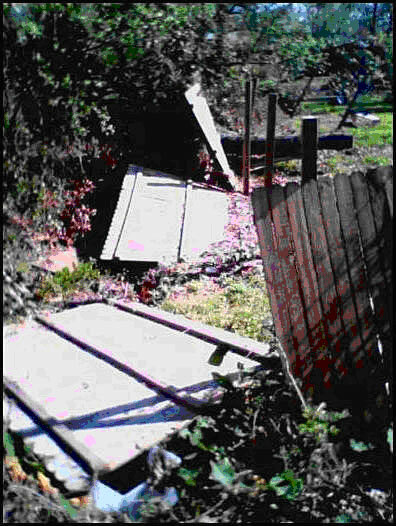 Some damage to chimneys; branches broken off trees; shallow-rooted trees pushed over; sign boards damaged. 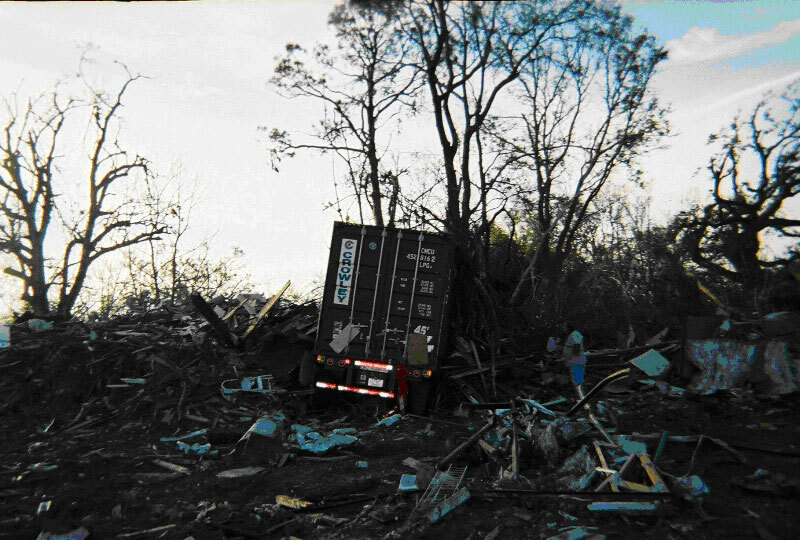 F5 261-318 Incredible damage. 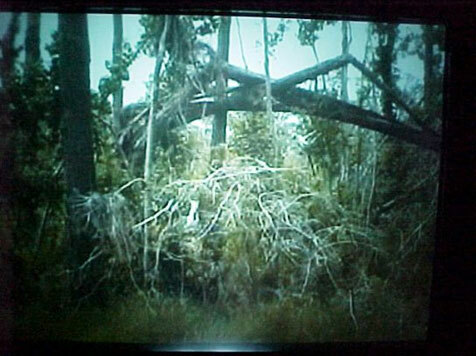 Strong frame houses leveled off foundations and swept away; automobile-sized missiles fly through the air in excess of 100 meters (109 yds); trees debarked; incredible phenomena will occur. 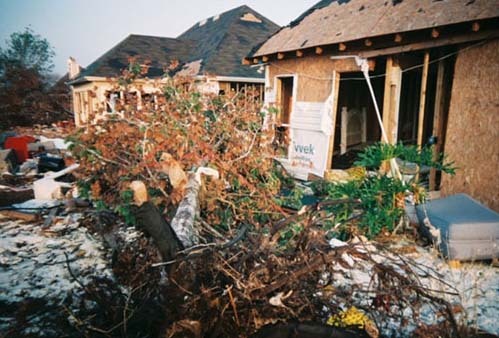 During the summer of 2005, David Jungblut spent time in New Orleans as Hurricane Katrina approached and later did a scientific investigation into the damage that the hurricane inflicted because homeowners’ insurance claims were being rejected. 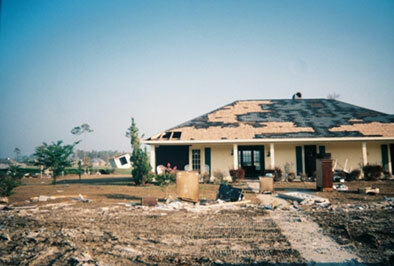 Insurance companies claimed that all damage was due to flooding and not wind. 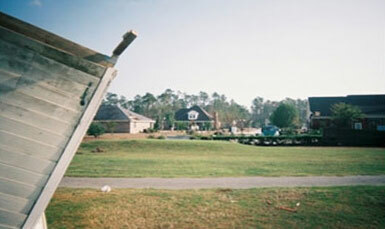 David Jungblut pointed out that wind damage was visible. He wrote reports about his findings, all pro bono. 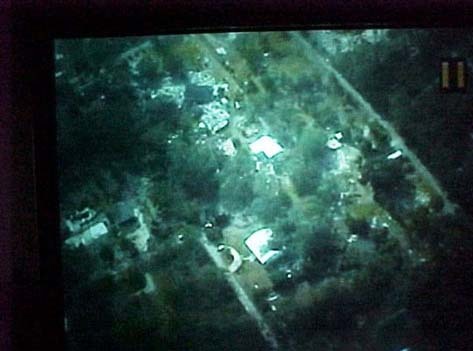 Later he posted his findings at http://www.hurricanekatrinastudy.com/ that was available to homeowners, engineers and lawyers free of charge. 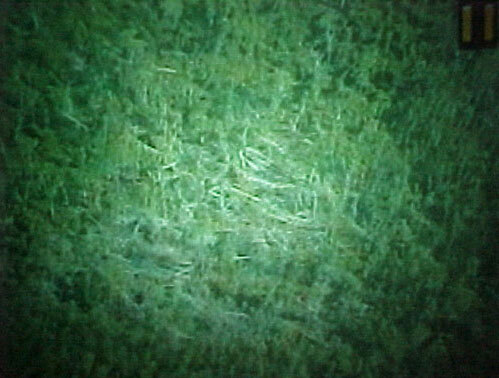 Peer review was done by Joe Hochreiter, senior environmental scientist from Yardley, Pennsylvania. The information transmitted is intended only for the addressee and may contain confidential and/or proprietary material. Any unauthorized review, distribution or other use of this information, or the taking of any action in reliance upon this information, is prohibited. If you received this in error, please contact the sender and delete or destroy this message and any copies. Picture 9: This picture was taken looking west on Crescent Shore Drive. 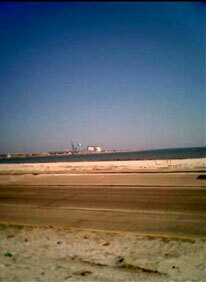 Picture 11: This picture was taken looking east on Crescent Shore Drive. Picture 12: This picture was taken looking east on Crescent Shore Drive. 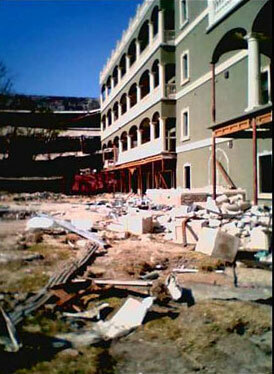 Picture 13: This picture was taken looking northwest from Hummingbird Lane. Three trees are twisted together. 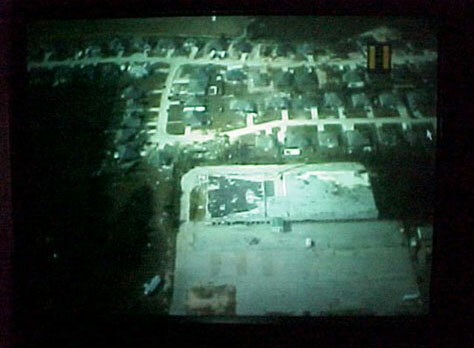 This picture was taken looking northeast from an airplane at Ascot Drive. This picture was taken looking south from an airplane. side rather than the right side. 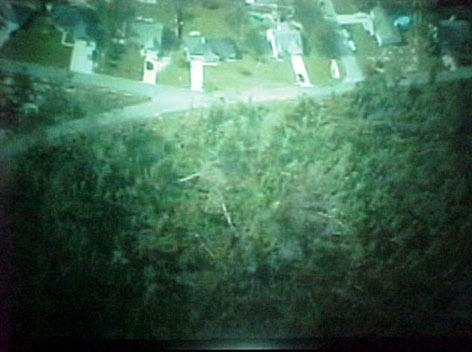 Picture 7: This picture was taken looking east on Crescent Shore Drive. 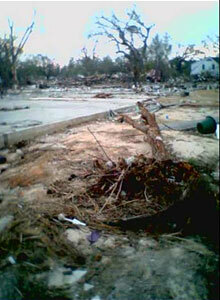 Picture 6: This picture was taken looking east on Crescent Shore Drive. to a house on Dismuke Avenue. 1. 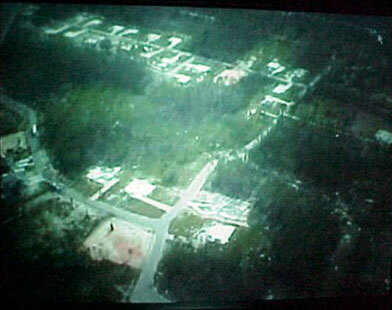 The house on the right has holes in the roof and walls. 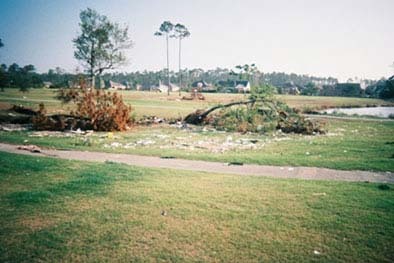 Picture 4: This picture was taken looking north onto Southwinds Golf Course. 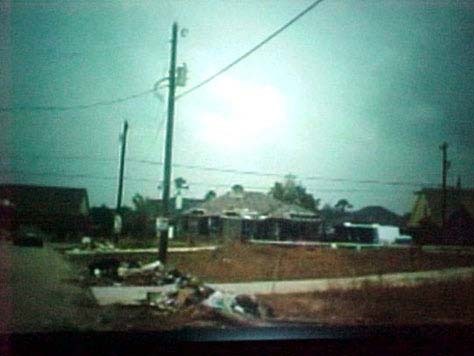 It is the same house found on the left side in Pictures 2 and 3.
in Biloxi that I saw when following a straight-line wind path. 2. A hole in the roof is shown. 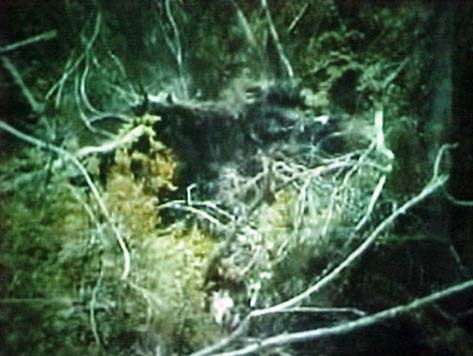 can be seen in Picture 2. They are on Nassau Circle West. 1. 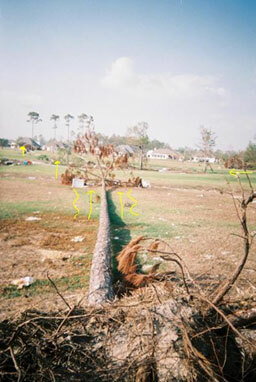 The tree on the right shows that it fell from east direction to west. in the apartment complex in Biloxi. 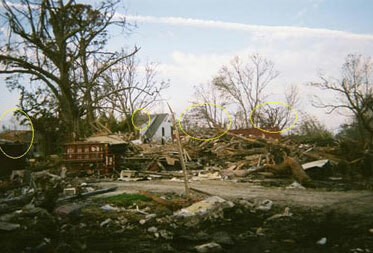 to the tree, shed, tree line in Picture 1.
the direction that the tree fell on the right side in Picture 2. 2. 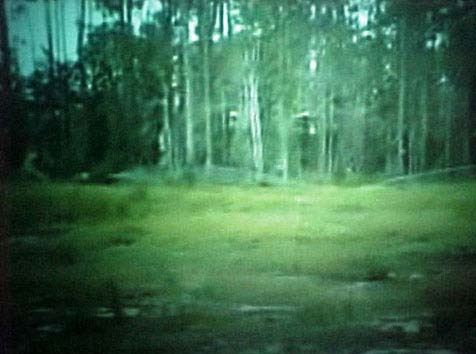 Southwest to northeast direction line indicated by the net and wood. 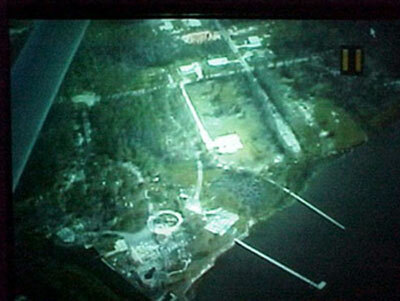 This picture was taken looking southwest. 1. 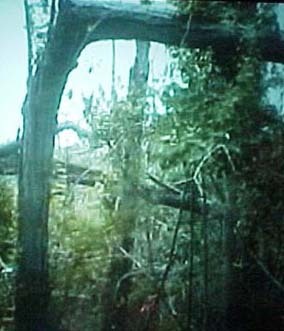 The tree in the foreground has fallen in an east to west direction line. 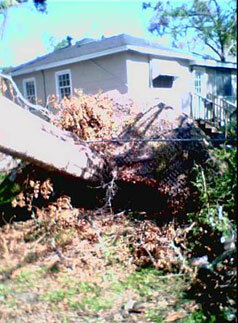 the right side in Pictures 2 and the tree in Picture 3 fell. 2. 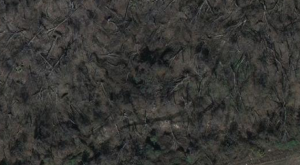 Southwest to northwest flood direction is indicated by cloth. 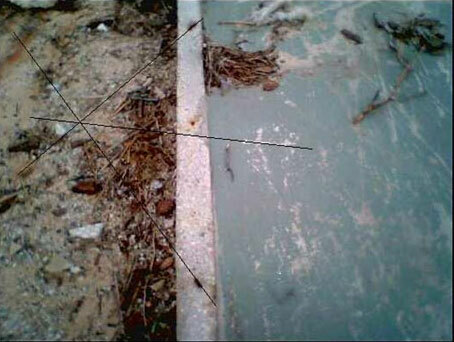 same line, or parallel, to tree right side in Pictures 2, 3 and 4. 1. 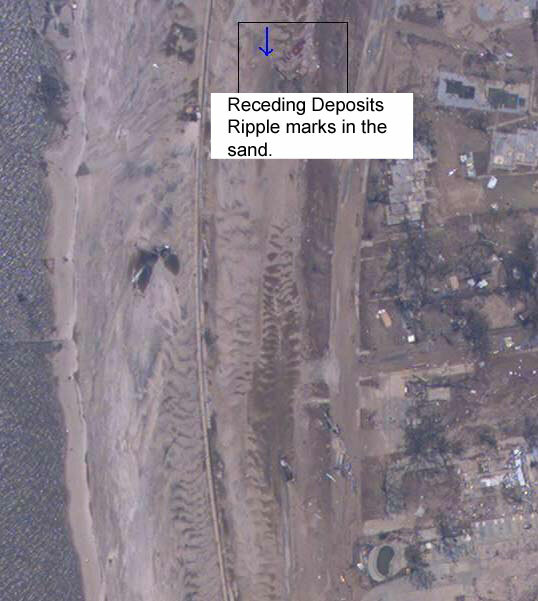 The foreground post indicated the flood direction, southwest to northwest. are the same as Picture 6. Two lines of force can be seen. 1. 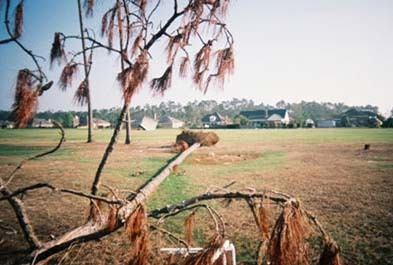 The trees fell in the wind event from the southeast to the northwest. 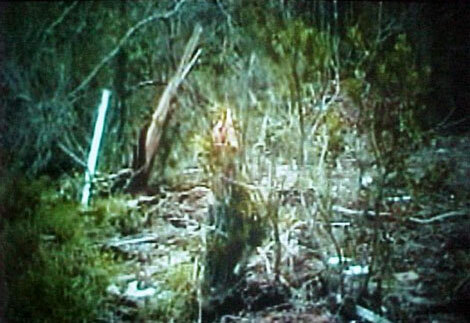 Neither of the two trees showed any evidence of collision. 2. 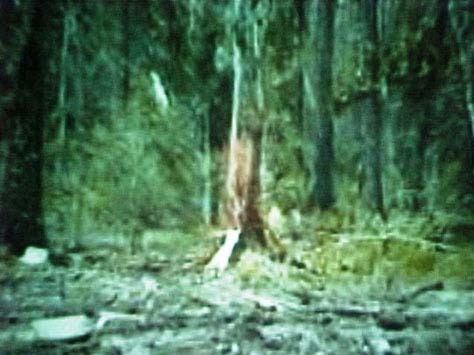 The tree on the right had been deflected to the right. because of the flood waters from the southwest. 1. 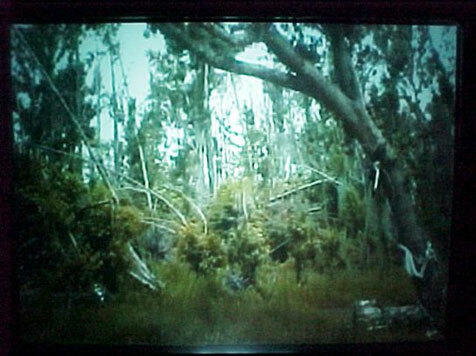 The two trees in the foreground show straight-line winds came from the easterly direction. on the far right. 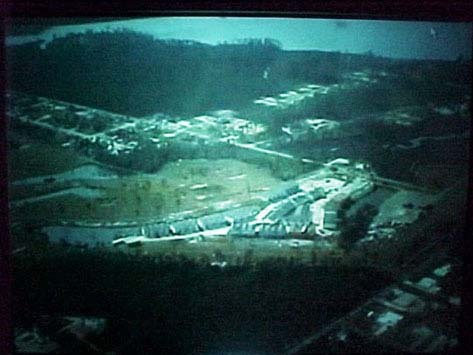 Apartments line the golf course on far left side. 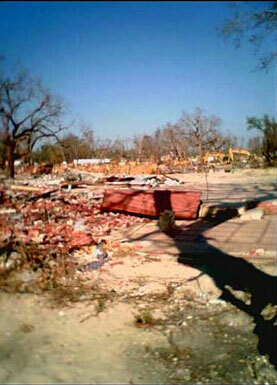 David Jungblut, Geologist: Why Were So Many Properties Destroyed During Hurricane Katrina? 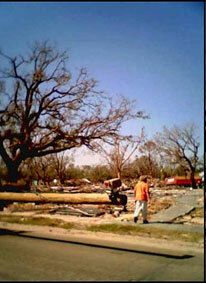 David Jungblut, Geologist: How Was My House Destroyed; Was It by Wind or Water? 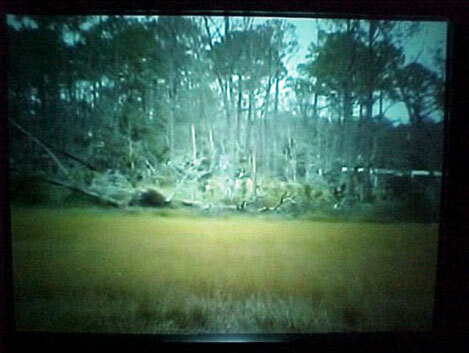 Charles Chip Lockwood III, with a documentary of the trips to Mississippi. Three students have worked on the documentary; they are: Colleen Dirkes, Leanna Dattolo and Kierstin Wunder. Christopher Sopuch, with placing my paper with pictures on the web. Two students are working with him; they are: Vincent Brunetti and Gena Petrillo. 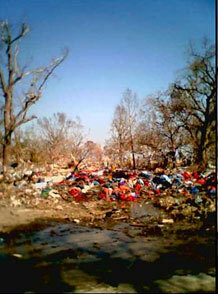 I am teaching students how to evaluate pictures from the hurricane site. 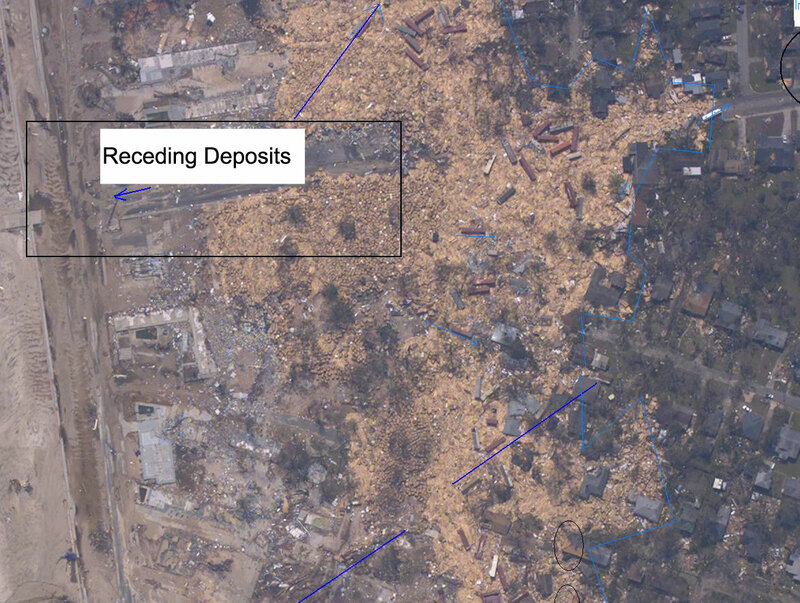 To help with assess damage. Some students that are doing nice work are Michael Schumacker and Todd Dorn. Brenna Baker, Joe Seaman, Lea Fitzpatrick and Nathan Schreiber have helped with content discussions. Joe Hockreiter, senior environmental specialist from Yardley, Pennsylvania has conducted a peer review of my research. 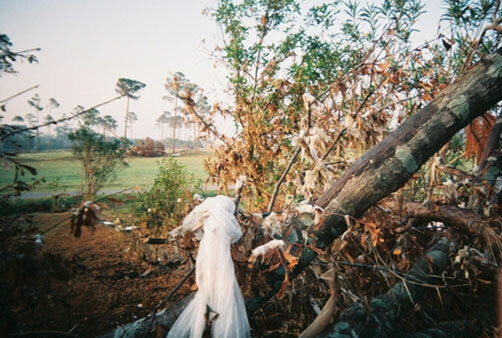 Future plans include using my research as a teaching tool and having students do projects related to events that happened during Hurricane Katrina.